I measured the final size at about 5-and-a-half-feet across, which is big enough that it’s even hard to find a surface to drape it over for easy photographing. It turns out you have to go find a fence to accommodate that. Am I complaining about the finished size? Abso-freaking-lutely not. I love it. I’m a 5-foot-9-inch-tall gal and a bit of extra length on a shawl is just fine by me. I like the simplicity and versatility of this pattern, because it really is good for all occasions. It can be a wrap-up-while-watching-TV shawl or a drape-over-the-couch-for-whenever-you-need-it shawl, but is pretty darned fine as an I-am-impossibly-elegant-while-wearing-this-with-jeans-even-though-I’m-only-dashing-out-for-Starbucks shawl. Anything goes. In her pattern instructions (well, more like guidelines, really) in the Knitter’s Almanac, Elizabeth Zimmerman gives you a few options for finishing the border. If I did this pattern a 3rd time (because this is actually my 2nd go at it), I’d probably go for one of the lacier border options, but the garter stitch edge is simple and practical and does the trick. It also lets you conserve brain cells right up until the very end of the project, and save them for other more complicated knits in your life. In the end I worked (I think) 70 rounds of the final section, and if I’d stopped at 60 that would have been fine too – and probably would be an adviseable stopping place for shawl-wearers more petite than I. I judged the final length by holding up the width from centre to outside edge against my arm, and when it felt like I was just about at half of my own ‘wingspan’, I stopped the rounds and started the knitted-on border. It’s the sort of project that lets you do that kind of thing, without encumbering you with too much decision-making. That Elizabeth Zimmerman was pretty groovy, I tell you what. I won’t lie, there’s probably going to be a 3rd one of these shawls in my knitting life. I don’t know when exactly, but it’ll happen. A girl can never have too many shawls, can she? Happy knitting this fine weekend! How absolutely fabulous!!! Love your blog. Very pretty! And I really like your color choice. It’s beautiful, and it looks wonderful on you! I would wear it to Starbucks too! I’m doing my first shawl now (my first lace knitting, too) but it’s not nearly as big a project as yours. I’m not sure I could handle such a large project. You definitely have stick-to-it-tiveness. Can you please tell me what effect the blocking has?? I have never really heard of it until about a month ago, and as I would love to knit a shawl, would like to know more 🙂 By the way, I love your blog. So what’s the solution? Do we call it, instead, a “wrap?” or as Suzette says, an “accessory?” That category may be too broad. Should we give a new name to “shawls” for this new millennium? I think this is an idea worth exploring! You’re a “thinking” lady (definitely not a “crazy knitting lady”) and your readers all enjoy you (as I do) – how about it? Maybe you should run a contest, Glenna, to come up with a new name. It would create some “buzz” for your website but, more importantly, it would dispel this myth that “shawls” are for old ladies! Shawls are for beauty, for warmth, for accessories, for whimsy, for women, for ? Let’s start a revolution. So worth it! And yes you are right, A girl can never have too many shawls! 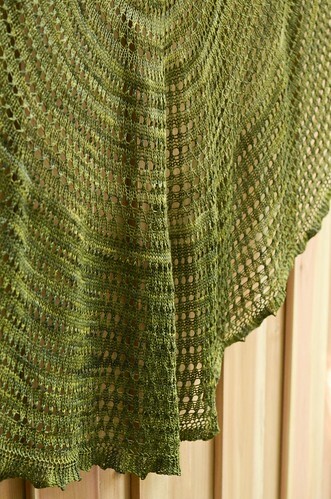 Gorgeous shawl! And the color difference looks like a deliberate effect, lovely! I made the exact shawl (in red) with the same border! I have yet to block it so was extremely interested to see how you did it. I also want mine to grow a little. Beautiful! It makes me want to knit one, even though I don’t need to test my patience. Beautiful – in the first picture it looked rather like the cross section of a tree trunk. I love the architectural quality of the stitches seen up close. One day maybe I’ll get around to knitting one? I’ve been thinking about making one of these for at least 10 years. Thanks for the convincing that it is worth it. Gorgeous and the colour is wonderful on you. Awesome shawl! 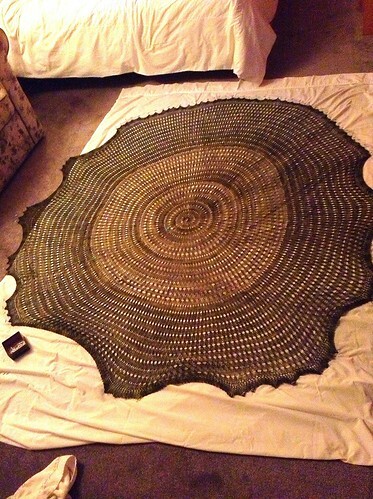 Thanks for the blocking-in-progress picture–I’d always wondered how one would set up blocking a round shawl so it stayed round! Simply gorgeous! Love the details and colors. Truly inspiring. Perhaps one day I’ll be crazy enough to tempt myself and talk myself into contemplating something of this caliber. 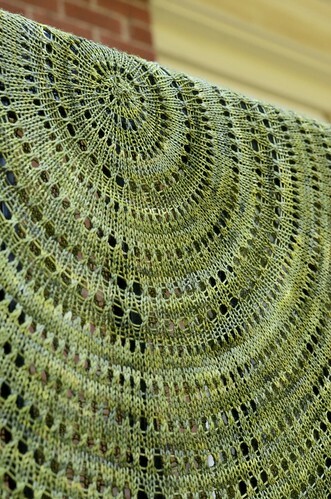 The circular knitting intrigues me. Have enjoyed your blog for quite a while and have always found it very interesting. in Shawls and Scarves edited by Nancy J. Thomas. (Page 50). Here EZ adds a few centre motifs and a more elaborate edging. Kinzel her two books The Book of Modern Lace Knitting Vol. I and II are still available from Dover. And on blocking I fold my large circular or square shawls in half over blocking wires and then block, by pining the two halves together, since they are lace even with the double layer they dry within 24 hours. And, also both sides match in length and diameter. The line formed in the centre of the shawl by the blocking wires can be gently steamed out after the shawl is dry. Beautiful! What is the stitch pattern you used? It looks like some k2tog with a yo. Is that right? Or is it something more elaborate? Now the inspiration is in me to knit a pi shawl, but I’m at a loss on how I’d drape it over my body… Same goes with triangular shawls. Maybe you could do a blog post on how you wear your shawls? This is beautiful! I just got the Knitter’s Almanac myself, and I love Zimmermann’s style of writing. 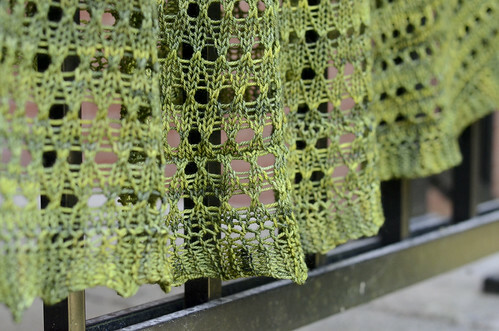 This shawl is so simple, yet the finished result here is just stunning! Love your shawl/wrap -it’s stunning and looks just beautiful on you! I love that you can wear it with jeans…otherwise I would seldom wear it! I’ve loved this for years but have been hesitant to tackle it – I think you just gave me the nudge I need! I was always afraid that it would look old and granny-like – but you’ve proved me very wrong! Thanks for sharing and congratulations on a gorgeous piece of knitting! This is beautiful. Just stunning. I am wondering though, what stitch did you use in between the increase rows? I knit a worsted weight Pi Shawl (EZ’s for that matter, from the Almanac) but I just did it in stockinette. You’re however, is far more stunning with just that stitch pattern. So if you don’t mind sharing what it is? An absolute beauty! 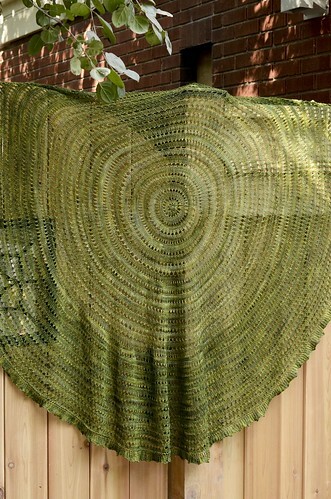 Never knitted a shawl in the round, but this one makes me want to give it a try. 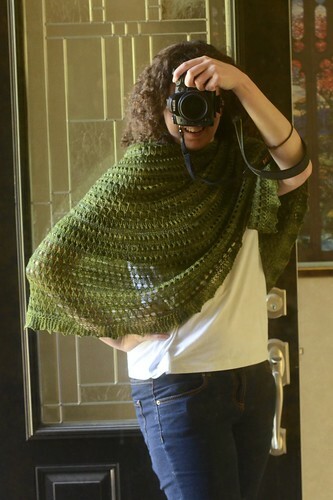 This shawl is fabulous! I’m really digging the color and the size and the fact that the increase rows are blended in nicely. I haven’t yet knit a circular shawl because I’m not sure how I feel about wearing it, though yours looks great doubled up and draped. I might have to try it. absolutely stunning! and you’re very encouraging. I got the EZ book for chirstimas a few years back but was intimidated about the idea of starting something so big. I’m going to do it now.